Our Family Christmas | God is in the details! 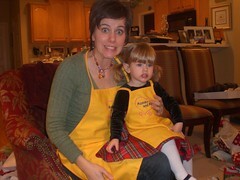 Sheila gave Brandy/Nora and Amanda/Lydia matching “Mommy and Me” aprons and kids’ cookbooks. 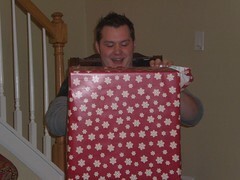 Jason was very excited about the mixer Darrell and I gave him! 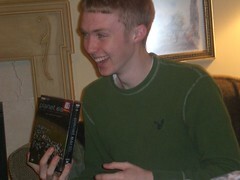 David was excited about both of the gifts we gave him. He loves the Discovery Channel video series called “Planet Earth.” (I do too!) 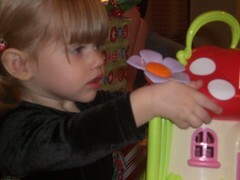 But most of all, he loved the Barbie toy Darrell gave him (j/k.) 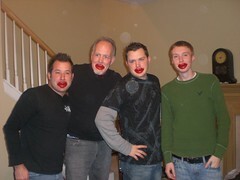 Darrell and David have had a “Barbie” tradition since David’s 6th birthday when Darrell gave him a Barbie doll as a joke- plus some kind of foam ammunition toy gun. David and his friends who attended the 6th birthday party used Barbie as a target to play with that gun- and LOVED it! 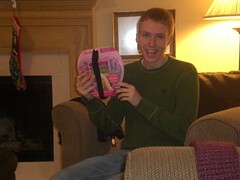 Ever since then, Darrell has creatively found a way to give David a Barbie toy at every holiday. David has turned the joke on Darrell a few times over the years, too! 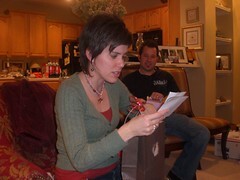 Amanda and Les….Amanda is about to open one of her favorite gifts: makeup and skin care from Skin Solutions. 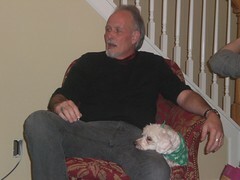 Darrell and Charmin. 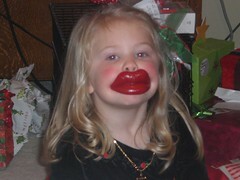 We brought Charmin with us so she could “celebrate” with the family. She was actually very good. Sheila has a tiny poodle named Bandit. Thankfully, the dogs get along very well. Sheila cooked a lot of yummy food for us. 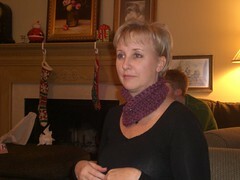 Here she is modeling the handmade “scarf-let” Amanda gave her. 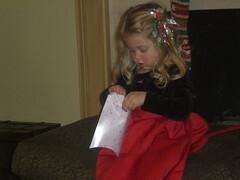 Lydia “got” the idea of opening Christmas presents…it’s fun! 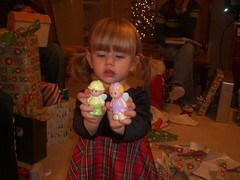 In both pictures she is holding pieces of the cutest fairy cottage Aunt Sheila gave her. 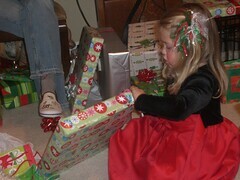 Nora knew the Christmas gift routine well this year. You can see she is very serious! Well, at last, between family and ministry Christmas celebrations- other than taking down the tree and decorations- I’m looking forward to Christmas 2008 already! SO FUN! I just emailed you pictures, too! How fun!! I have that mixer, too. It’s the best!! We did have a nice time! 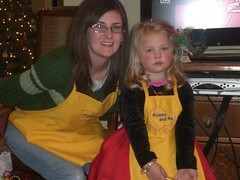 I love the mommy cooking stuff that we got!!! You got some good pictures! 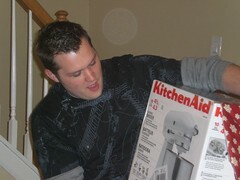 Jason is going to town on his new Kitchen Aid Mixer! Merry Christmas!